Summary of data presented by Melanie Grossman, MD at the American Society for Dermatologic Surgery Meeting in Denver, CO, November 2000. Studies conducted by Melanie Grossman, MD, Marisol Edward, RN, and Roy Geronemus, MD, at the Laser and Skin Surgery Center of New York. Two prospective, controlled studies were conducted to determine the safety and efficacy of the Cutera CoolGlide aesthetic laser for the removal of unwanted hair in tanned patients of skin type I – IV with brown or black hair. Enrollment for the initial study was 20 tanned subjects. Each subject received a single treatment on three test areas, and an untreated control site, of 3 cm by 5 cm each and was followed at 1, 3 and 6 months to evaluate epidermal response and hair counts. These safety results were further confirmed in the second study in which larger areas, up to 15 cm by 15 cm, were treated on 38 tanned subjects and followed for 1 month. Treatments were performed on arms, legs, backs, shoulders, abdomens and bikini lines. The actual enrollment in the two studies consisted of skin type II (31%), skin type III (24%) and skin type IV (45%) patients. Immediate post-treatment reaction included erythema and edema. No blistering or purpura were seen. The treatments for the first study were performed at 15, 20, and 30 ms pulse widths using the 10 mm spot size and pre -cooling handpiece of the CoolGlide system. The fluence was determined by the investigator for each patient with an average fluence of 63 J/cm2 (range of 50 to 70 J/cm2). Summary of data presented by Suzanne Kilmer, MD at the American Society for Laser Medicine and Surgery Annual Meeting in Reno, Nevada, March 2000 and in clinical white papers. 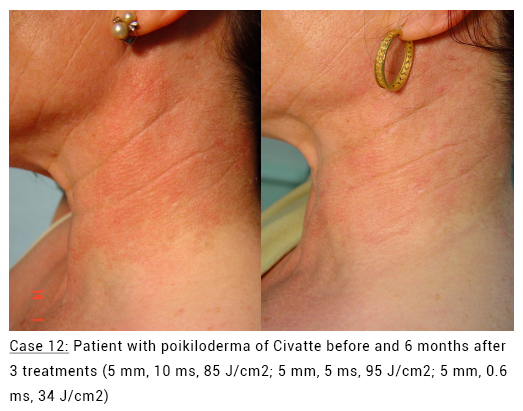 This prospective, controlled study was conducted to determine the safety and long -term efficacy of the Cutera CoolGlide aesthetic laser for the removal of unwanted hair in 25 subjects with Fitzpatrick skin types I – V and brown or black hair. At the 3 month follow-up visit, half of the treatment sites received a second treatment. All epidermal observations after the 1 day visit were rare and transient, having all cleared. Shown below are the combined results (median hair count reductions compared to baseline) for all treatments performed at 50J/cm2 fluence and 15 ms pulse width, and 60 J/cm2 fluence and 30 ms pulse width. This paper is a summary of the 15-month results of a study intended to determine the safety and efficacy of the CoolGlide long-pulse high-power Nd:YAG laser for the removal of unwanted hair in subjects with Fitzpatrick skin types I-V. This laser system is being evaluated in a prospective, controlled, single-center clinical study in 25 subjects. All sites were shaved and treatments were performed using fluences of 50 J/cm2 or 60 J/cm2, and pulse widths of 15 ms or 30 ms. At the 3 month follow-up visit, half of the treatment sites received a repeat (second) treatment. The study is being conducted at the Laser and Skin Surgery Center of Northern California. The principal investigator is Suzanne L. Kilmer, MD; and the co-investigators are Vera Chotzen, MD; Marla McClaren, MD; Jacqueline Calkin, MD; and Susan Silva, MD. The table below shows the combined results for all treatments performed at the maximum fluence for each pulse width (50J/cm2 fluence at a pulse width of 15 ms, and 60 J/cm2 fluence at a pulse width of 30 ms). All safety observations after the 1 day visit were rare and transient, having all cleared. Further study details are being prepared for journal submission. Effective treatment of facial acne scarring presents a major challenge, with current therapeutic modalities including punch or elliptical excision, ablative laser skin resurfacing (CO2, erbium:YAG), chemical peels, dermabrasion, subcision, and injection of filler substances such as collagen, hyaluronic acid, and autologous fat grafts (1). Given the varied morphology and depth of acne scars, which range from subtle atrophic “rolling” to deep “boxcar” and “ice pick” lesions (2), most cosmetic surgeons advocate a combination approach, tailoring the treatment to each subtype of lesion. Ice pick scars, for instance, may require punch excision, while subtle rolling atrophic scars traditionally respond well to laser skin resurfacing using either carbon dioxide or erbium:YAG systems (2,3,4). The best cosmetic results are often achieved when combining both punch excision and laser skin resurfacing techniques (5). Unfortunately, many of the traditional surgical and ablative laser techniques used for the treatment of facial acne scarring present challenges of patient discomfort, morbidity, and significant downtime. (7). 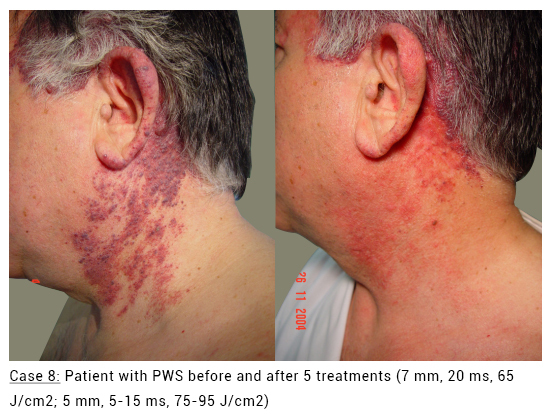 Subsequent studies demonstrated improvement of atrophic facial scars treated with the pulsed dye laser using both purpuragenic (8) and subpurpuric (9) settings. It is now known that a wide range of visible light (8,9) and infrared lasers (10-14) of variable wavelengths, pulse durations and fluences can all stimulate dermal collagen synthesis. Furthermore, radiofrequency-based heating of dermal collagen produces both immediate collagen tightening and increased expression of collagen type I messenger RNA (15). Most of these lasers (e.g. 1320 nm Nd:YAG, 1450 nm diode) and RF devices use cryogen or contact cooling to achieve selective dermal heating while sparing the epidermis. In contrast, a novel short-pulsed 1064-nm infrared laser (CoolGlide Vantage, Cutera) produces gradual dermal heating through cumulative absorption by oxyhemoglobin within the normal dermal microvasculature. The temporal and energy profile of this laser (0.2-0.5 msec, 5-7 Hertz, 13-18 J/cm2) facilitates diffusion of heat from the dermal microvasculature into the surrounding papillary and reticular dermis without inducing purpura or epidermal injury. In contrast to many current non-ablative light and radiofrequency devices, treatment-associated discomfort is minimal, and no epidermal cooling is required. The purpose of this pilot study was to evaluate the safety and efficacy of a manually scanned, short-pulsed 1064-nm Nd:YAG laser (CoolGlide Vantage, Cutera) for the treatment of moderate to severe facial acne scarring. The primary study endpoint was treatment-blinded physician assessment of scar severity as measured by digital photographs taken before and 1-2 months after a complete series of 8 laser treatments. The secondary endpoint was patient assessment of treatment outcome, as measured by a follow-up phone survey or questionnaire. Ten patients (7 male, 3 female; mean age 32 years, range 15-48 years) with Fitzpatrick skin phototypes I-V and mild to severe facial acne scarring were enrolled in the study after obtaining informed consent and 9 completed the study (Table 1); one male dropped out after 2 treatments for non-treatment related reasons (scheduling conflict). Exclusion criteria included pregnancy, history of keloidal scarring, recurrent facial herpes simplex infection (>6 episodes per year), ongoing nodulocystic acne, isotretinoin use within 2 months of the study, or laser skin resurfacing or dermabrasion within 1 year of the study. With the exception of isotretinoin, patients were allowed to continue their topical or oral acne medications during the study. With the exception of one male patient, who had received erbium laser resurfacing for his acne scars 18 months prior to the study, no other patients had received prior treatment for their acne scars. All patients were treated by the same physician and prepped with a gentle non-alcohol based cleanser to remove all make-up prior to each procedure. In order to reduce absorption by coarse facial hairs, male patients were required to shave prior to each treatment. Treatments were conducted with appropriate patient eye shielding at all times. Patients were treated in 2 treatment zones: the left cheek, chin and lateral temple; and the right cheek, chin and lateral temple. During each treatment, each zone received 2000 pulses using the following laser parameters: 1064 nm wavelength, 0.3 msec pulse duration, 14 J/cm2, 7 Hz, 5 mm spot size. The treatment was administered by manually scanning the rapidly pulsed laser in an even, painting motion throughout the entire treatment zone. The laser handpiece was oriented perpendicular to the skin at all times, at a distance of 1-2 cm. Throughout the treatment, patients were asked to give verbal feedback if any treated area became “too hot”; in this manner, patient feedback provided an additional safeguard against inducing unwanted epidermal injury. 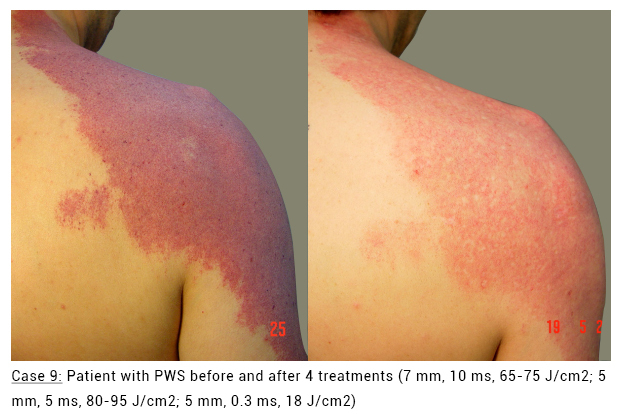 During the first 1000 pulses of treatment, the entire treatment zone was evenly painted in a rapid, rhythmic fashion, inducing uniform mild erythema. This also induced mild analgesia, with all patients reporting that the sensation of heat dissipated within the first 1000 pulses. During the second 2000 pulses, the manual scanning rate was slowed, increasing the “dwell time” over areas of scarring while following patient feedback to avoid discomfort. No topical anesthetics or oral analgesics were administered before, during or after the treatments, and no skin cooling was required. Patients received 8 sequential treatments, each spaced 2 weeks apart. High-resolution digital photographs (Sony Cybershot DSC-F717) were taken of each patient at baseline, and again 2-4 weeks after the final treatment. All photographs were taken in a standardized manner (en face, 45 degrees left, 45 degrees right), without a flash, using fine resolution (5.0 megapixels) and macrolens settings. Pre- and post-treatment photographs were assessed by 3 non-treating, blinded independent observers (board-certified dermatologists) using the following weighted scale: 3 points for deep, 2 points for shallow, and 1 point for superficial scars. For each patient, corresponding 10 cm2 x 10 cm2 grids from before and after pictures were graded for overall acne severity in this manner. As a secondary outcome measure, patients were asked to assess their percentage of improvement using the following five-point scale: 0. No or minimal improvement (0-10%); 1. Slight improvement (11-25%); 2. Moderate improvement (26-50%); 3. Significant improvement (51-75%); and 4. Marked improvement (>75%). Patient global assessment was determined by phone interview or written questionnaire completed 1 -2 months after the final treatment. Patients were also asked to rate overall treatment discomfort on a scale of 1 (none) to 4 (severe) and to report any treatment associated adverse signs or symptoms. *1 patient with SPT III dropped out of the study after 2 treatments for non-treatment related reasons. The primary outcome measure was change in scar severity score (pre- versus post-treatment) as assessed by three blinded evaluators evaluating pre and post photos for each subject. Observers counted the number of each type of acne scar (rolling - least severe, boxcar - more severe, and ice pick - most severe), and then multiplied by its weighting factor (rolling = 1x; boxcar = 2x; ice pick=3x), yielding the overall score. The difference of evaluation effect among the three evaluators was tested by one-way ANOVA based on the mean percent change from pre to post. No statistically significant difference among the three evaluators was found (P-Value=0.1195), and this data was pooled together. The percent change from pre to post of overall scores was calculated. The mean, standard deviation, median and range for pre, post and percent change were generated. The difference of mean percent change was tested using student’s paired t-test with a significance level of 0.05. Acne scarring improved in 100% of the nine patients completing the study (Table 2). Scar severity scores improved by a mean of 29.36% (95% CI: 16.93%-41.79%, P-value=0.006). Scar severity scores showed some interobserver variability, however this was not statistically significant (P-Value=0.1195). 8 of 9 patients (89%) reported subjective improvement of their acne scars, ranging from 10% -50%. One patient with severe baseline scarring (mean scar severity score = 108) noted scar improvement of less than 10%, in agreement with his improvement in scar severity score (9.88%). All patients reported being satisfied with their treatment results, and all stated that they would undergo treatment again. Two patients (both female) noted that their acne scars were “shallower” and easier to conceal with make-up following treatment. Treatments were well tolerated, with overall treatment discomfort rated at 0 (“none”) or 1 (“minimal”) by 8 of 9 patients. One patient (SPT III) noted grade 3 (“moderate”) discomfort during his initial treatment, which reduced to “minimal” discomfort for all subsequent treatments. Treatment-induced erythema was characterized by all subjects as being both mild and transient, with no subjects reporting erythema persisting for more than 2 hours after treatment. No patients reported blistering, scarring, purpura, crusting, persistent swelling, pain or other adverse events, and none noted flaring of their acne following treatment. Of note, 2 patients (both female) reported apparent improvement of their inflammatory acne, although this was not quantified. Pooled data analysis of scar severity scores (N=9). Subjects showed a mean improvement of 29.36%, with individual percent improvements ranging from 9.88% to 46.60%. There was a statistically significant difference from Pre to Post scores (P-Value=0.006; 95% CI= -16.93%, -41.79%). Although clinicians have a potent arsenal of treatments for active inflammatory and cystic acne vulgaris, the scarring residue of acne remains difficult to treat. When severe, acne scarring can be emotionally debilitating, leading to poor self-image and, in some cases, exacerbating clinical depression (17). Acne scars vary in morphology and depth, ranging from superficial “rolling” atrophic scars to deep “icepick” and “boxcar” lesions extending into the deep reticular dermis and, in some cases, into the subcutis. Consequently, the most effective treatment plans employ a combination of approaches including: punch and elliptical excision for deep scars; subcutaneous incisionless surgery (subcision) and/or filler substances for tethered or “rolling” scars (2,18); and chemical, mechanical, or laser resurfacing for the epidermal and superficial dermal ablation of shallow scars. Ablative treatments for acne scarring such as carbon dioxide (CO2), erbium (Er) and CO 2:Er blended lasers work by thermally stimulating collagen neosynthesis while stripping away varying depths of epidermis and dermis. Unfortunately, by compromising the epidermal barrier, these modalities necessitate up to 2 weeks of patient downtime for epidermal recovery, with associated adverse events including patient pain, persistent erythema, transient hyper- or hypopigmentation, milium formation, dermatitis, and the potential for more severe complications (i.e. infection, keloid or hypertrophic scar formation, permanent hypopigmentation). In contrast, a wide range of visible and infrared laser, IPL and radiofrequency devices can thermally induce dermal collagen synthesis while sparing the epidermis. How these nonablative devices work to remodel the dermis remains the subject of active research, but photothermal (or electrothermal) injury is likely the major stimulus. Sublethal heating of vascular endothelial cells and fibroblasts is thought to initiate a cascade of dermal remodeling through the induction of cytokines (e.g. platelet-derived growth factor) and enzymes (e.g. collagenases) involved in the normal wound healing process (19,20). When thermal injury is limited to the dermis, the desired effect of stimulating dermal collagen production and remodeling can be accomplished while avoiding the unwanted consequences of epidermal injury such as infection, pain, and erythema. Many nonablative lasers (e.g. 1320 nm Nd:YAG, 1450 nm diode), IPLs and RF devices require cryogen or contact cooling to achieve selective dermal heating without epidermal injury. In contrast, a novel short-pulsed 1064-nm infrared laser (Vantage, Cutera) produces gradual dermal heating through cumulative absorption by oxyhemoglobin within the dermal microvasculature. The temporal profile of this laser (0.2-0.5 msec) closely approximates the thermal relaxation time of small, normal dermal capillaries (approximately 0.1 msec), providing gradual, selective dermal heating when rapidly scanned over a target area of skin. Our findings support the use of a short-pulsed, low-fluence 1064 nm Nd:YAG laser as a safe, effective treatment for facial acne scarring. We noted scar improvement in all treated subjects with minimal discomfort and no downtime. Acne scarring improved in 100% of the nine patients completing the study. Our treatment protocol of eight sequential treatments, spaced 2 weeks apart, yielded significant objective and subjective scar improvement in all treated subjects with minimal treatment-associated discomfort and no downtime. Scar severity scores improved by a mean of 29.36% (95% CI: 16.93%-41.79%, P-value=0.006), and 89% of patients reported subjective scar improvement of at least 10%. No treatment-related adverse events were observed. Consistent with results from other nonablative laser and radiofrequency modalities, this short-pulsed 1064 nm Nd:YAG treatment appears to be most effective at reducing scar depth and softening scar contours, and least effective at treating scars with a deeper, “icepick” morphology. Strategies combining this procedure with traditional acne scar remedies such as punch and elliptical excision and ablative laser skin resurfacing should hold much promise in the future. Study results of non-ablative dermal remodeling have traditionally been limited by small sample size, lack of controls and lack of objective measurement. We attempted to control for observer bias by using a blinded observer format and a standardized scale to quantify the severity of acne scarring (scar severity score). Although scar severity scores showed some interobserver variability, this was not statistically significant (P-Value=0.1195). Nevertheless, there are other methods for objectively analyzing scar improvement. Friedman et al. have used a three-dimensional topographical imaging technique, The PRIMOS imaging system, to generate 3D virtual models of the skin surface at variable time points, allowing investigator to compare surface microtopography in an objective, quantifiable manner; this study included one patient with acne scarring, treated with a 1064 nm Q-switched Nd:YAG laser (five treatment sessions, spaced at monthly intervals). 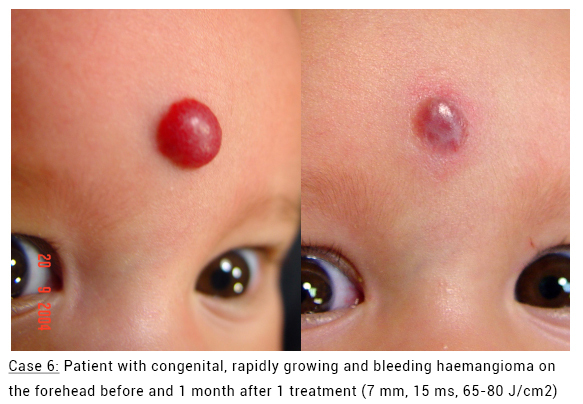 At 6 months follow-up, objective skin roughness had decreased 33% in the patient with acne scarring (16). In a related study, the PRIMOS system confirmed a modest improvement in facial acne scars treated with either the 1450 nm diode or 1320 nm Nd:YAG lasers (13). Such attempts to quantify subtle differences in skin texture are important, since they provide an objective means for analyzing treatment efficacy. Future studies of the short-pulsed 1064 nm Nd:YAG laser for the treatment of acne scarring should aim to further quantify the results suggested above while optimizing treatment intervals and parameters. Goodman G. Post acne scarring: a review. J Cosmet Laser Ther 2003;5:77-95. Alster TS, West TB. 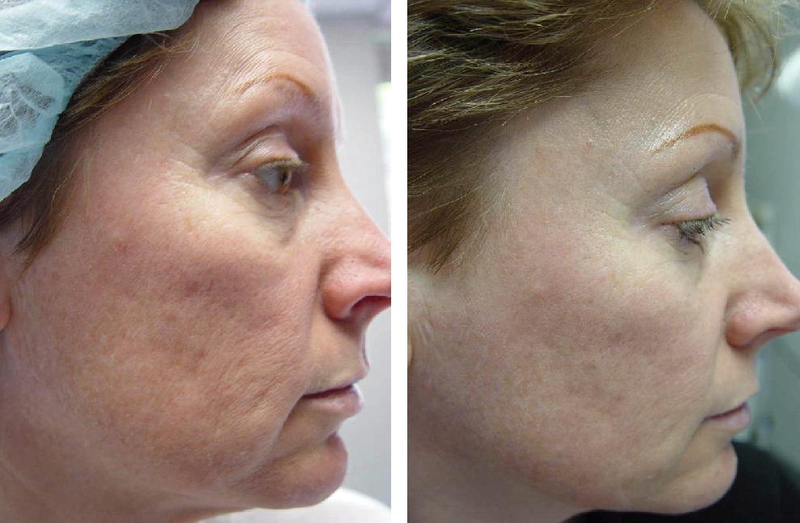 Resurfacing of atrophic facial acne scars with a high-energy, pulsed carbon dioxide laser. Dermatol Surg 1996;22:151-4. Tanzi EL, Alster TS. 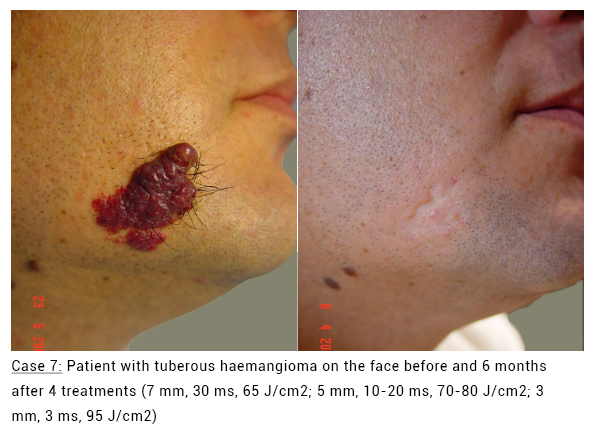 Treatment of atrophic facial acne scars with a dual-mode Er:YAG laser. Dermatol Surg 2002;28:551-5. Grevelink JM, White VR. Concurrent use of laser skin resurfacing and punch excision in the treatment of facial acne scarring. Dermatol Surg 1998;24:527-30. Zelickson BD et al. Effect of PDL and IPL on dermal extracellular matrix remodeling. Lasers Surg Med 2000;12:17. Zelickson BD et al. 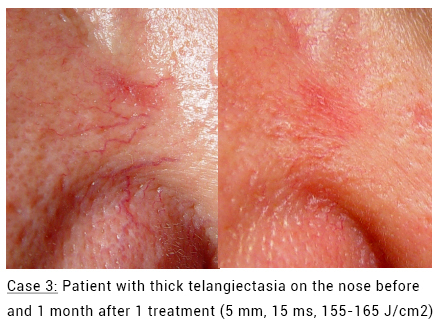 Pulsed dye laser therapy for sun damaged skin. Lasers Surg Med 1999;25;229-36. Alster TS, McMeekin TO. Improvement of facial acne scars by the 585 nm flashlamp-pumped pulsed dye laser. J Am Acad Dermatol 1996;35:79-81. 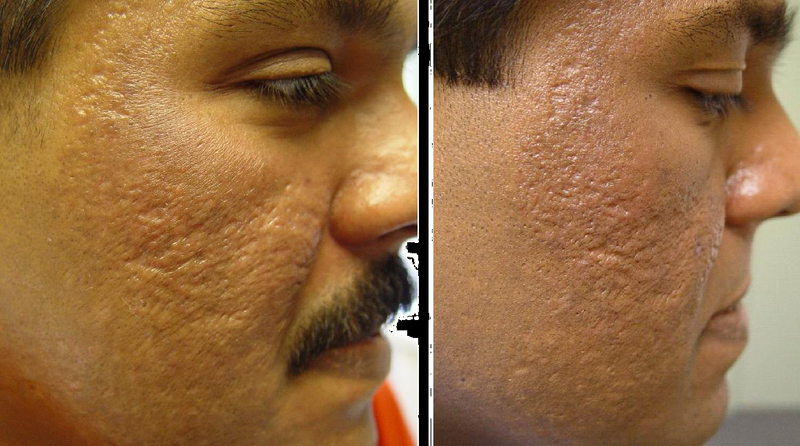 Patel N, Clement M. Selective nonablative treatment of acne scarring with 585 nm flashlamp pulsed dye laser. Dermatol Surg 2002;28:942-45. Goldberg DJ et al. 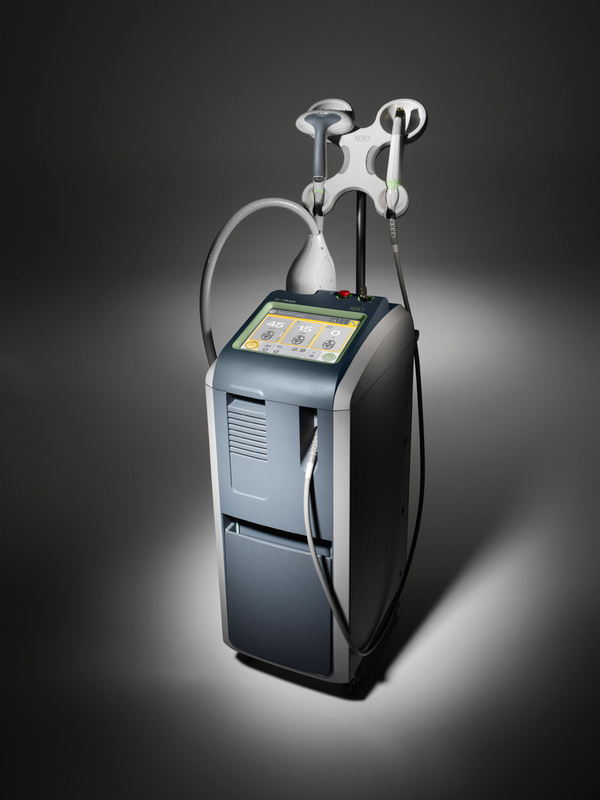 Laser skin resurfacing with the Q-switched Nd:YAG laser. Dermatol Surg 1997;23:903-7. Nelson JS et al. 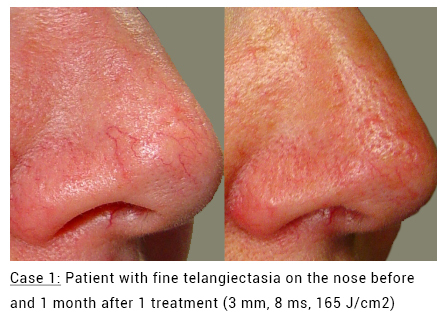 Clinical study of non-ablative laser treatment of facial rhytides. Lasers Surg Med 1997;95:32-36. Kelly K et al. Cryogen spray cooling in combination with nonablative laser treatment of facial rhytides. Arch Dermatol 1999;135:691-5. Tanzi EL et al. Comparison of a 1450 nm diode laser and a 1320 nm Nd:YAG laser in the treatment of atrophic facial acne scars. Lasers Surg Med 2002; suppl 14:109,33. Tanzi EL, Aster TS. Comparison of a 1450-nm diode laser and a 1320-nm Nd:YAG laser in the treatment of atrophic facial scars: a prospective clinical and histologic study. Dermatol Surg 2004;30:152-7. Friedman P et al. 3D in-vivo optical skin imaging for topographical quantitative assessment of non-ablative laser technology. Dermatol Surg 2002;28:199-204. Koo JY, Smith LL. Psychologic aspects of acne. Pediatric Dermatol 1991;8:185-8. Mordon S et al: Mechanism induced by selective laser targeting of the dermis microvasculature: an in-vivo experimental study [abstract]. Lasers Surg Med 2001;13 (suppl):4. Zelickson B, Kist D: Pulsed dye laser and photoderm treatment stimulates production of type-I collagen and collagenase transcripts in papillary dermis fibroblasts [abstract]. Lasers Surg Med 2001;13(suppl):33. Representative photographs of acne scar improvement taken before (A, C, E) and after (B, D, F) treatment with a short-pulsed 1064 nm Nd:YAG laser. Photos were taken 2-4 weeks after the last treatment. Improvement is noted in scar contours, depth and erythema. Laser Unit. Dermatology Department. Hospital Clinic. Dermatology Department. Hospital General de Catalunya. 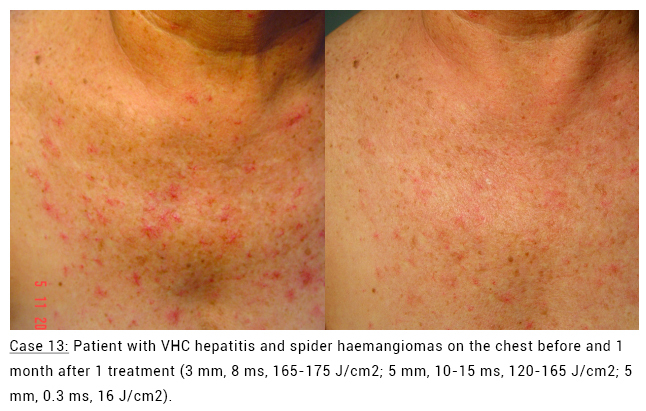 J/cm2) (CoolGlide Vantage, Cutera) was evaluated for the treatment of a wide spectrum of vascular lesions. deeper or thicker lesions and decreased with longer or additional cooling with ice packs. patient according to the characteristics of their lesions is responsible for the high success rates on all lesions achieved in our experience. vascular condition with high rates of success and safety.